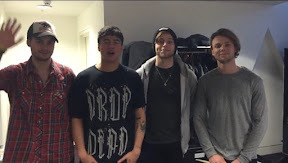 5 Seconds of Summer made a Scots heart patient's dream come true after sending her a private video message urging her to get better. The Aussie rockers and She Looks So Perfect hit makers played two sell out gig at Glasgow's SSE Hydro when they were told of Scots school girl Rachel Moffat's struggle. Rachel, 14 from Motherwell is currently bed bound in The Royal Hospital for Sick Children after undergoing a second heart transplant. She has just come out intensive care but is on dialysis. Mum Mary said: "Rachel had a heart transplant when she was seven but took unwell again last year . She was admitted to Glasgow Sick Kids in November and had another heart transplant on December 18. It was a Christmas miracle but because she was so ill she didn't really wake up until the end of January. I got her a 5SOS book and hoodie for Christmas and tickets for the gig but she couldn't go. She had spent over twenty one weeks in hospital now and she's got problems with her kidneys and critical illness neuropathy so her muscles in her body are affected and she can't really move." "She has moved to dialysis and it seems to be going well although she has lost a lot of weight and needs nutrition." Her birthday is in June 18 and we aim to get her sitting up to go home." Rachel who is a huge 5SOS fan had been hoping to watch the boys perform in Glasgow after seeing them twice before in Scotland but was too unwell to attend the concert. So instead of her going to the gig, the lads came to her via special video message after Dreammaker charity worker Les Hoey MBE and his team got in touch with them. Mary added: "We are progressing but not fast enough for her to go to 5 Seconds of Summer. It was incredible when Les told me they were going to send a video message." The lads including Calum whose dad is from Edinburgh told her: "Hey Rachel. It's 5 Seconds of Summer. We're thinking about you and sending all our positive vibes and all our love. We hope to see you at a show soon." Rachel who watched the video from the renal ward said: "This has made my year. I'm so thrilled. It's wonderful. Nobody at my school Coltness High will believe it." Mary added: "She has the biggest smile ever now and is over the moon." Without families donating and organ donation she'd not be here and we want to thank everyone for giving her inspiration and positivity."